Sterling Silver Heart Tag Necklace with T-Bar and Toggle securing clasp. Ladies solid Necklace of 4.5mm gauge wide Belcher Curb Link chain in 460mm 18inch length. 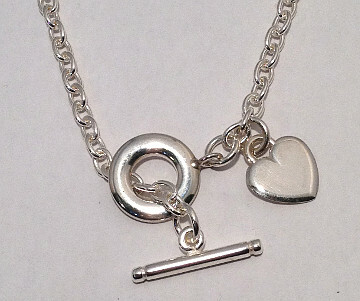 Classic Heart Tag design with solid 925 Silver Toggle and 16mm T-Bar to secure Necklace. Popular Heart shaped Pendant Tag attached to solid Sterling Silver belcher chain, approx. 15mm size Heart Tag.